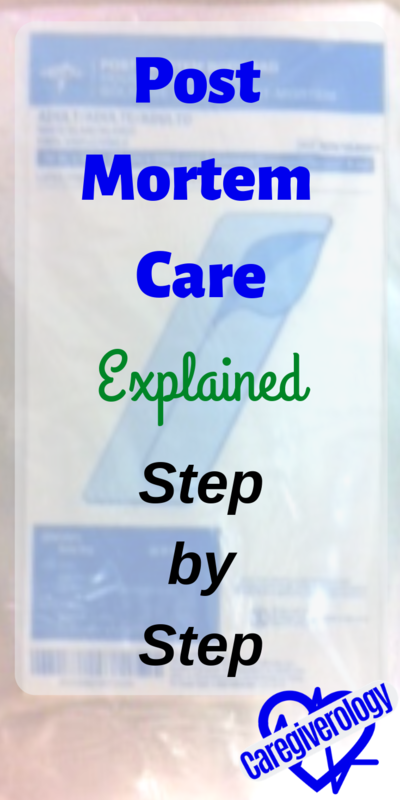 Post mortem care is one of the most difficult things to do as a caregiver. It is something nobody enjoys doing but it is something that must be done after a patient passes away. First of all, it should be noted that even though the patient has passed away, they should still be treated with respect. This is especially true around family members and loved ones. This is definitely not the time to stick with strictly "business" and not show any compassion and understanding. The family and loved ones may have customs that you are unfamiliar with. There are many different cultures with different backgrounds and religious beliefs. They may mourn differently or do things that seem strange to you. Do not under any circumstances interrupt them during their practices. The only exceptions would be if they are disturbing or causing harm to others. Whenever the time seems right, ask them if they need anything. Make sure they know that you are available if they do need anything and let them know that they can stay for as long as they please. Do not rush them out of the room so you can begin the physical part of the post mortem care. What's important right now is that the family is as comfortable as possible. After you are sure that they have left and are completely done with their visit, you may begin. Have another caregiver assist you with this process. If there is a sign that you are supposed to place outside of the door in the hallway, make sure you do that first. Close the door and pull the curtain. Prepare the water for the bed bath. Raise the bed up and flatten it out. 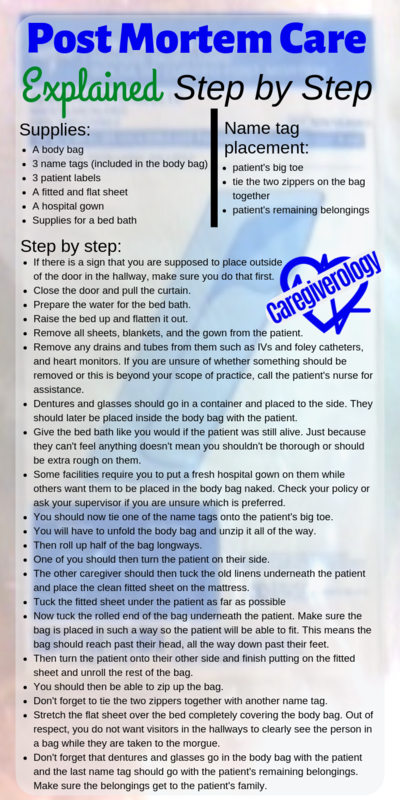 Remove all sheets, blankets, and the gown from the patient. Remove any drains and tubes from them such as IVs and foley catheters, and heart monitors. If you are unsure of whether something should be removed or this is beyond your scope of practice, call the patient's nurse for assistance. Dentures and glasses should go in a container and placed to the side. They should later be placed inside the body bag with the patient. Give the bed bath like you would if the patient was still alive. Just because they can't feel anything doesn't mean you shouldn't be thorough or should be extra rough on them. Some facilities require you to put a fresh hospital gown on them while others want them to be placed in the body bag naked. Check your policy or ask your supervisor if you are unsure which is preferred. You should now tie one of the name tags onto the patient's big toe. You will have to unfold the body bag and unzip it all of the way. Then roll up half of the bag longways. One of you should then turn the patient on their side. The other caregiver should then tuck the old linens underneath the patient and place the clean fitted sheet on the mattress. Now tuck the rolled end of the bag underneath the patient. Make sure the bag is placed in such a way so the patient will be able to fit. This means the bag should reach past their head, all the way down past their feet. 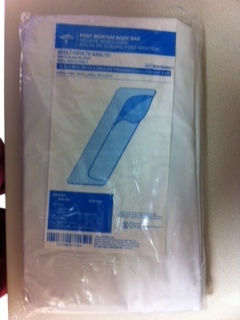 Then turn the patient onto their other side and finish putting on the fitted sheet and unroll the rest of the bag. You should then be able to zip up the bag. Don't forget to tie the two zippers together with another name tag. Stretch the flat sheet over the bed completely covering the body bag. Out of respect, you do not want visitors in the hallways to clearly see the person in a bag while they are taken to the morgue. Don't forget that dentures and glasses go in the body bag with the patient and the last name tag should go with the patient's remaining belongings. Make sure the belongings get to the patient's family. If the patient has been dead for a few hours, a process called rigor mortis may have set in. This means that they will be stiff and harder to move around. When this happens, it is still possible to perform post mortem care but it is better to take care of them beforehand. If their mouth is wide open, you should gently close it and place a rolled up towel underneath their chin. Doing this will prevent their mouth from staying open after rigor mortis sets in. Even though the patient is dead, their body still may do things you wouldn't expect them to do. Do not be alarmed or afraid if something unexpected does happen. Just know that such things are normal and continue with your care. One of the main things that may happen is their muscles may twitch or have slight spasms. When you roll the patient onto their side, it is possible for them to release air from their lungs. This will sometimes make a vocal sighing sound. It is also possible for fluid to come out of their mouth. Sometimes they will have their eyes open or one of them may open while turning them. If this happens, you can gently close their eyelids with your fingers. I for one do not particularly enjoy performing post mortem care. It is probably my least favorite part of my job as a registered nurse (previously certified nursing assistant) at a hospital. I guess I can be a little emotional at times but I know it has to be done. You can't let these situations get you down. Caregiver depression is very real and should be avoided at all costs. If doing this kind of work is effecting you personally, seek help.